The quality of a public transit ride is defined by all aspects of a rider's experience, from the time of departure to arrival at the destination. Beyond a rider's experience in the transit vehicle, there are two additional significant components to a "full" transit ride: the connection between a transit stop and one's origin/destination; and the experience waiting for the arrival of the transit vehicle. 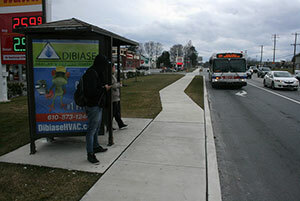 In this context, the provision of amenities such as a bus shelter and sidewalk connections have influential roles regarding the quality of public transit in Chester County. "A high-quality transit stop is one that is well connected to the neighborhood or community it serves, accommodates the needs of all transit passengers safely and comfortably, and permits efficient and cost-effective transit operations." Transit stops are located along the bus routes in the urban and suburban municipalities served by public transit. 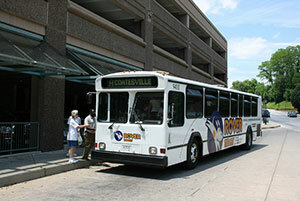 The primary service provider in Chester County is SEPTA, although additional bus routes are provided by the Transportation Management Association of Chester County (TMACC) including the Coatesville Link, Route A, and SCCOOT (a partnership with the Southern Chester County Organization on Transportation); and the Pottstown Area Rapid Transit (PART) which provides bus service to the Coventry Mall and North Coventry Township. Transit centers are hubs served by multiple transit routes and provide multimodal options and transfer opportunities for transit users. Transit centers within Chester County include the West Chester and Exton Transportation Centers. The Paoli Intermodal Transportation Center is in the process of being designed to provide multi-modal options for transit users, including maintaining existing coordinated bus route connections and providing for new coordinated shuttle service opportunities. 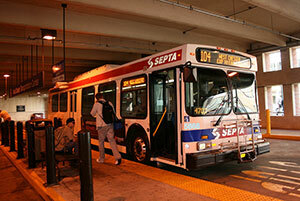 Transit agencies are not responsible for the design or maintenance of transit stops in Chester County. Therefore, the provision of high-quality transit stops requires a partnership between transit agencies, Transportation Management Associations, municipalities, PennDOT, and property owners. Energy Conservation: The reduced need for individual automobile trips can reduce gasoline use and energy consumption. Encouraged Use of Public Transit: Transit stops and centers can provide safe and ADA-accessible opportunities for the utilization of transit services. Better Public Transit Facilities: Enhanced facilities can provide greater ridership potential for public transit. Design Limitations: Local and regional factors may complicate the provision of transit stops and centers, such as topography; climate; sight distance; heavy and/or fast-moving vehicular traffic; narrow, limited, and varying rights of way; ADA-accessibility; subsurface utilities and above-grade obstructions; lighting; lack of public sidewalks and crossing protections, usage volume. Multiple Party Cooperation: Cooperation and agreement between multiple parties is necessary before action can be taken, including but not limited to private property, local municipal ownership, state department of transportation jurisdiction and transit company oversight. An excellent resource that municipal officials should reference when planning for new or upgrading existing transit stops is SEPTA Bus Stop Design Guidelines, prepared for SEPTA by the Delaware Valley Regional Planning Commission (DVRPC) in October 2012. 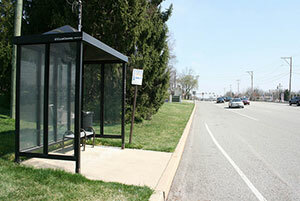 Some existing transit stops provide a shelter without providing the proper pedestrian access to the shelter. This transit stop provides shelter and pedestrian access.